Announcer: You are listening to the Nancy Gaines show. The goal of this broadcast is to help business owners be successful and gain the advantage. Nancy has helped some of today’s top Fortune 500 Companies atop a wide spectrum of industries work through their toughest challenges. She can help you too! So if you can’t find the solutions you need, there are no more books to read or workshops to attend. The Nancy Gaines show can be the difference between your success and failure. And now your host, Nancy Gaines. Nancy: Hi, this is Nancy Gaines and welcome to the Nancy Gaines show, where we provide actionable ideas for entrepreneurs to grow their business and be even more productive. So the focus of today’s podcast is all about leadership, and I am so excited to have an amazing guest with me, Mark Villareal. He is the author of Shortcuts Get You Lost. Welcome Mark, would you like to tell our group a little bit more about you? Mark: Well, thank you, Nancy. I appreciate being on the show, and it’s an honor. Yes, I am a big leadership advocate. I have a strong passion for leadership. I will say that early in my career, as I became a leader, I realized that the more I focused on other people’s success, mine came naturally. So, it really helped me to develop within myself then, how do I define peoples’ objectives and goals? How do I build a roadmap to success for my people? And then, over time, how do I teach future leaders how to do that as well? Nancy: That is awesome. What do you think is the difference between leaders and managers? Mark: Well, sometimes you have one that can be autocratic. Do as I say, not as I do. I think a true leader, is someone who leads with humility, and I preach that when I talk about values, that I put humility first. I believe that humility is a strength and not a weakness, and it allows that leader to be genuine to their people, and to understand their people’s goals and objectives within their business, but also personally. When you come across genuine to your people, they will follow you. People have an innate hunger, I would say that they want to be led. But they look for those true leaders that have that gift that can develop that. I call that servant leadership. It is nothing new out there to an extent. But not all leaders serve their people. That is why it is important to me, to lead with a servant leadership lifestyle. Nancy: I like that. 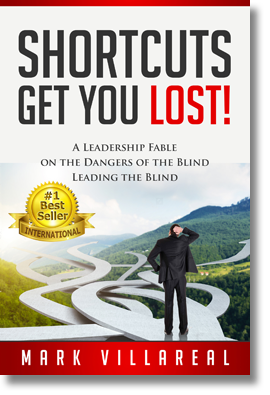 So how did you come up with the name of your book, Shortcuts Get You Lost? Mark: You know, it’s a funny story, but I talk about my mom a lot. In fact, I have blogs out there on my website and on my LinkedIn profile, and I always share stories that I learned from my mother and how it is relative to business today. So, Shortcuts Get You Lost, was a story about one time I was coming home from school and I used to always watch these kids that lived on my same street, but they would take a shortcut. And they would get home sooner than I did. But I did not know that shortcut, and so one day I took it, and I got lost, and I got scared. And then I had to backtrack to where I started that shortcut and I got home later. Which my mom was first afraid, and then she was angry. She taught me, “Mijo, the danger,” and mijo means my son in Spanish. “The dangers of a shortcut is, when you get lost, you have to backtrack to where you started and it will take you longer. And the bigger danger is had you had success, then you start taking other shortcuts in life, and shortcuts will get you lost.” That is where that title came from because I preach it when I talk to leaders, when I build business plans, and I always talk about a roadmap to success. I think, Nancy, you know as well as I do it is important that we can give our people a roadmap to success. How to spend time on things or what’s important and what’s not important to put aside, and how to recognize when you are straying from that roadmap to get back on plan. Nancy: Your mom was pretty insightful. So how do you tie this in together into leadership? 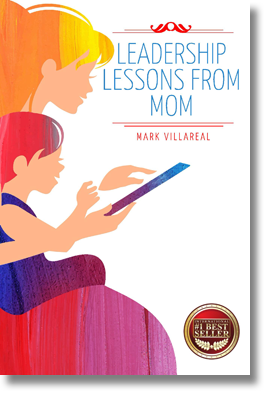 Mark: Everything that you learn as you are growing up from both your parents, but I always say that my mom was the best leadership coach, who chose to be a housewife, and she took pride in that. But it relates to when people are straying, so whether its sales or a business process, and people have a roadmap that they are supposed to follow, but they take a shortcut because maybe they want results quicker. They may have some success, but they may not have the full success that you could have had, and it makes them blind to it. I will give you an example that you may have a quick sale, but not realize that because you took a shortcut, you do not understand that organization whoyou sold to, their whole objective, and their whole plan.Â So you are celebrating, but you are blind to what you did not receive.Â So, we use it in everything, whether a flowchart in how to map out your day, to what things to give priorities to, and it really works strong in business. Nancy: Very cool. What is your favorite chapter of the book? Maybe the chapter with your favorite lesson? Mark: I would say that my favorite chapter is chapter 5, called The Current and the Rocks. And it’s funny, because it’s another story. But, this was one that I use an example of people that go whitewater rafting. They’re taught by the instructors to focus on the current and not the rocks. Because if you stare at the rocks you’ll stray towards them. So, I teach in that chapter that when you build a roadmap to success, how to keep your people focused on the currents, and how to challenge them to be stronger. How to raise the expectations, and how to lead them to where they will have that fun experience.Â If you have ever gone whitewater rafting, and you have people who focused on the rocks, your experience is going to be a lot different. And when you go whitewater raftingand you focus on the current, then you have a nice safe trip. Nancy: I have gone whitewater rafting. I never thought about looking at the rocks or the current. So the current would make sense right, because it basically lays out the path for you? Mark: Yes, it’s the safe flow. So you know, in the chapter it talks about first of all yourself, personally as a leader. Have you checked yourself in the mirror? Are you being genuine to your people? And then it talks about, there’s two views of success. Whose are you focusing on? Are you focusing on yours? Or are you focusing on your people? Because if you focus on your people, and if their goals and objectives are built properly within the organization, then yours will come naturally. The next part is, are you challenging your people, and raising the expectations and holding them accountable? And that’s where once again another saying my mom taught me was, if your climb was easy, maybe you chose a hill instead of a mountain. It’s important for us to sometimes climb those hills, and we can celebrate that success, but are we really looking to those mountains that we want to accomplish things? Nancy: That’s cool, now you have a day job right, verses being an entrepreneur? Mark: Yes, I do. I have been in the current business I am in for,(pause) I celebrated my 20-years last February. Nancy: Oh congratulations, are you a manager and leader in your current role? Mark: Yes, I am a Senior Vice President and so I have managed several different aspects in this business. We are what is called a franchise organization. So I have been on the franchisee side of the business, and the franchisor side. Presently I am on the franchisee side where we own twenty-two locations. So, we are one of the bigger ownership groups, and so I have managed a big portion of the organization. But what is exciting here is that two people that reported to me two years ago are now equals to me on the Executive Team, and, I take pride in that. That hopefully I had something to do with that, to help develop them, and that’s where humility comes in. Because that should excite you. One of the owners of the business is someone that I hired and trained into the business many years ago. And once again, I tell people, one of the best things you can ever do for your career, is to hire your future boss. Because when you do that, you train them, you develop them, the trust is there, and they share your same values. Nancy: Absolutely. So good for you for hitting twenty years and good for you for promoting your peers and I always like to think, promote your replacement, or find a replacement for yourself because that’s the only way you can move on yourself to bigger stuff is when someone can take on your work. Do you agree with that? Mark: I one hundred percent agree. Some leaders are afraid to hire people smarter people than them. I look for people that are smarter than me. And it’s awesome when they can grow, and you see them grow. But when you talk about, when you lead with humility, you want to learn from other people. And I always say, that the day I stop learning, is the day that I will die. Because I want to constantly learn and that’s why, you know, that even after twenty years in this business, I wrote a book. I am working on my next book. The things that I learn it’s just exciting. But, you can learn from everybody, and it just really creates a great environment when people see that as genuine leadership. Nancy: So where can people find your book? Is it available now? Mark: Yes, it’s currently on Amazon. It’s on Barnes and Noble.com. It’s also available on ITunes, and in Canada it’s also available on Kobo.com. So it’s out there. Nancy: Awesome! Very cool, and when people get your book what is the one takeaway you want them to remember? If there’s nothing else that they learn from the book, what is the one message? Mark: I think the biggest message would be everything is built on the foundation of the right values and principles. And if you don’t have the right values and principles, then things will go astray. 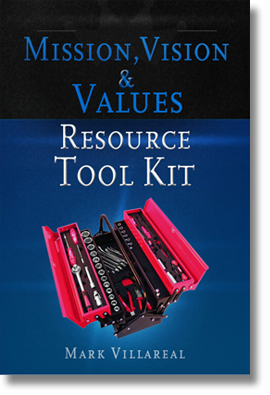 So it’s important that you first define what values and principles that you want to manage and grow your organization by, and that you live them every day. And everything else, every decision is built upon that. Your vision, your mission statements, and you point back to it. But, while humility is important, because if for a moment you don’t live a value, you have the humility to say, “I apologize. I had this value, I didn’t live it. But, because of humility being a value, I am correcting it right here.” When you do that, everything else builds strong and you build that stronger foundation that things can survive. Nancy: I totally agree. I have four values myself. They are decisiveness, persevere, simplicity, and fun. So, you’ve told us about humility is one of yours, do you have any other ones? Mark: Well, I think that I would like to think that I have ethics as a value, integrity, I always talk about that people that say that they have integrity as a value, but if someone dropped five dollars out of their pocket and they don’t tell them, then they just didn’t live their value. So, I go down to that very foundation, and then respect. And respect is important because, I have a saying here, and once again it came from my mother, but it’s everyone’s a ten. Because I think it’s very important that we show respect to every employee whether they make it with us, or whether they do not. And some of our best customers are former employees that weren’t successful with us. But it’s because we had the right environment, the right culture of respect, and so, they just understand it wasn’t for them. Nancy: That totally makes sense.Â So let me ask you my fun question that I ask everybody on my podcast. If you had one more hour in your day, how would you spend it? Mark: Well, it’s funny because I am a man of faith, so I would spend it in the bible.Â Recently my wife said, “I notice that you are getting up earlier every morning.” And I said, “Well, because I need my God time.” And if I had one more hour, that’s where I would direct it, and then let the rest guide me from there. Nancy: That’s perfect. Yes, even just meditating is just really helpful for people to kind of set their day. So, good for you, I like that answer. And then is there anything else you want to add that I didn’t think to ask you? Either about your book? Your business? Your life? Mark: Well, I would just say that it’s an exciting time in business and in leadership. You know we’ve had great leaders out there. Great people that write books. You know I am a big John Maxwell fan and there are others. One Minute Manager talks about catching people doing something right. I just think that it’s real important, that we as leaders look for those that want to be led. Especially with this millennial age. Because they are truly looking to be led, and I think we need to recognize that, and give them the time. Nancy: Great, those are great parting words. Well, I want to thank you so much for being on the show today. You gave some valuable tips. Some great advice. You inspired me in some new things too. Thank you for your time. Listeners, you can find our podcast on iTunes and sound cloud, and if you are looking for ways to structure your days with more systems I just created an amazing report. One hundred systems you must have to boost your results. You can find it at NancyGaines.com/systems. Until next time, go out and gain the advantage. Announcer: You’ve been listening to the Nancy Gaines show. Where you can gain the advantage. To schedule a VIP Strategy Day, or free consulting session with Nancy, connect with her on her website. Nancygaines.com, that’s Nancy G-A-I-N-E-S.com. On twitter, Nancy L. Gaines, and on linkedin, Nancy Gaines. Be sure to check back on Nancy’s website for new episodes. Until next time, you’ve been listening to the Nancy Gaines show. Go out and gain the advantage.